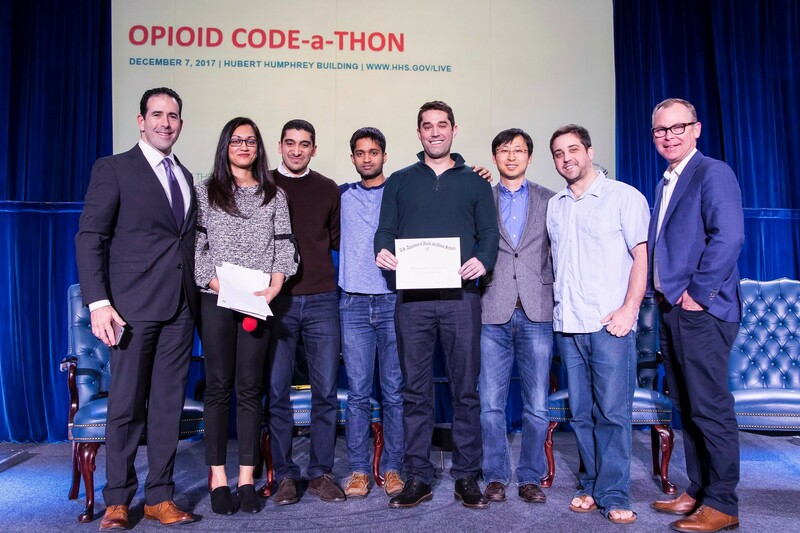 At the U.S. Department of Health and Human Services (HHS) National Opioid Symposium and Code-a-Thon in Washington, DC in December 2017, the HHS Chief Data Officer Mona Siddiqui and Chief Technology Officer Bruce Greenstein worked together to make 70 datasets on opioid use, treatment, locations of overdose, and other factors available to code-a-thon participants. All of the data resources ran on the AWS-hosted Socrata platform, in our FedRAMP environment, giving every participate access to a secure platform to share data that scales on demand. One winning team, Origami Innovations, was made up of a Yale University medical student, a Google software engineer, a machine learning engineer from Palantir, a John Hopkins pain management physician, and a Stanford pain researcher. They wanted data that could help them build an app to reduce deaths from opioid abuse and they found one on Connecticut’s open data portal. As a team of data scientists and developers, they appreciated all the datasets HHS made available and used them to quickly create a practical tool. Corbett says that so often discovering, gathering, and cleaning data can be 90% of a data scientist’s work. But, HHS took care of that effort for them. “We were immediately able to work on our app thanks to HHS and Socrata,” says Corbett. Corbett describes the opioid crisis as a “wicked problem,” data science parlance for a problem that is difficult to resolve due to incomplete or contradictory requirements. He says that more data can only help everyone find solutions to the opioid crisis together. Siddiqui agrees that the potential to release and share data is massive. As she helped gather and prepare the 70 HHS datasets for release during the code-a-thon, she was impressed by enthusiasm of HHS staffers for the event. She described it as “palpable” and says many staffers are already interested in HHS hosting another event soon with even more types of data available. Proactively offering researchers and entrepreneurs secure, scalable data is something HHS plans to continue doing. Siddiqui and Greenstein both agree that they’ll create more events in the near future, since this one was such a success – both in terms of coming up with solutions and also raising awareness about what’s possible when disparate datasets are made available to skilled problem-solvers. Left to Right: Bruce Greenstein, Mona Siddiqui, the Origami Innovations team, and Socrata CEO Kevin Merritt.